I got my red wig on Ebay, I searched red wigs, and sorted by lowest to highest, and picked the one which I liked the quality and style the best for its price. This one only cost $11.50. This is for halloween purposes so I didn't need it to be that nice, it will get really messy after a night out. I ordered dark green tights for $2 since I didn't expect to use it often. The color didn't come out as vibrant as I would have liked. Corsets on ebay can range in price. If you have the patience to bid, you can find them for about $5-$10. I won a bid on a red one for $6 (it doesn't matter what color, since all the leaves will cover it). Mine is a lace up back corset. Its pretty tough to put on and take off, so if you can find a zippered corset, it will be easier to wear. The ivy leaves actually took a bulk of the total cost! About $25. I was ordering on Ebay so I could not tell the size/color/quality as well. I was hoping for some medium-large sizes. I ended up having 4 different types of leaves and more than I needed. One order was from Joann which costed more but the quality was nice and thick. Two of the Ebay orders were bad cloth-like quality or too small. I used the smalls ones to patch up areas and wrap around my leg and arm. The best order I had was for 4 artificial silk leaves vines for $13. And they look like the ivy leaves picture below. They had a dark green color and quality worked well. Having a mix of sizes and colors gave some dimension to the costume too. Each leaf was easy to peel off the vines. Here I peeled off the entire vine. At first I used E6000 glue to attach the leaves, but it is messier than using a glue gun. For best results, layer from top to bottom, and keep it consistent. I was rushing it and didn't follow that process at first. But it will look a lot better if you layer row by row. For my eyebrows I used a Japanese blonde mascara to lighten them up a bit. I used brown eye shadow on top of that. For best results use red eyeshadow if you have it. For my eye makeup, I used the Urban Decay Vice Palette. The glittery dark green color with gold specks "Junkie" was used on the outer corner and leading into the middle of the eyelid. The gold color "Blitz" was used for the inner half of the eye lid. Blending both colors together. 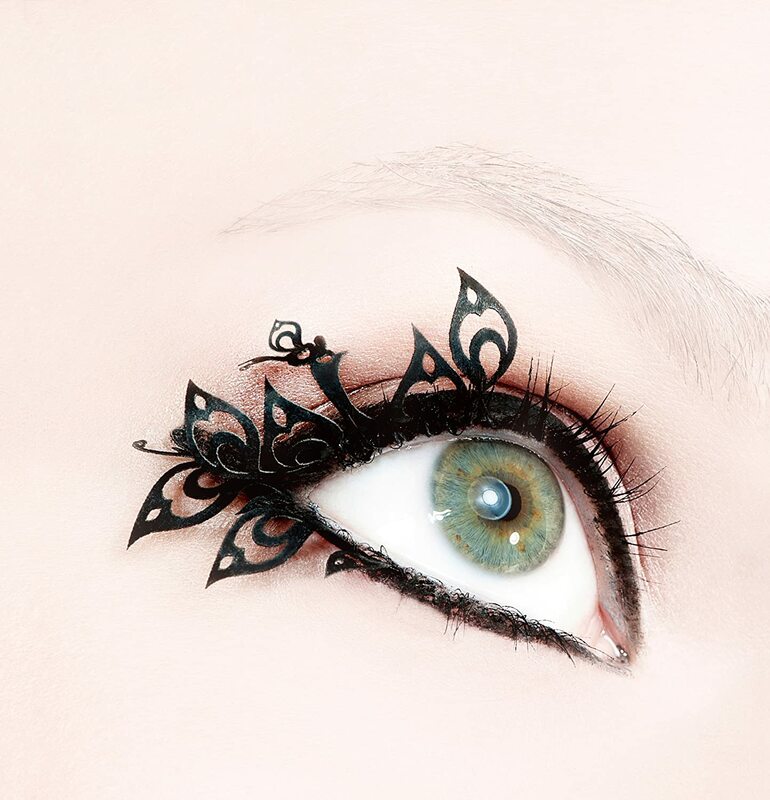 "Anonymous" was used to highlight under the eyebrow and inner corners. The bottom waterline was swiped with some "Blitz". I used Urban Decay glide-on eye pencil in "Zero" to tight line my upper lid. Then applied Bobbi Brown Long-Wear Gel Eyeliner in "Black Ink". I used Paperself Eyelashes in the Peacock Design. They are pretty long, so I cut off both ends of one lash, to attach to the top and bottom corner of my eye. 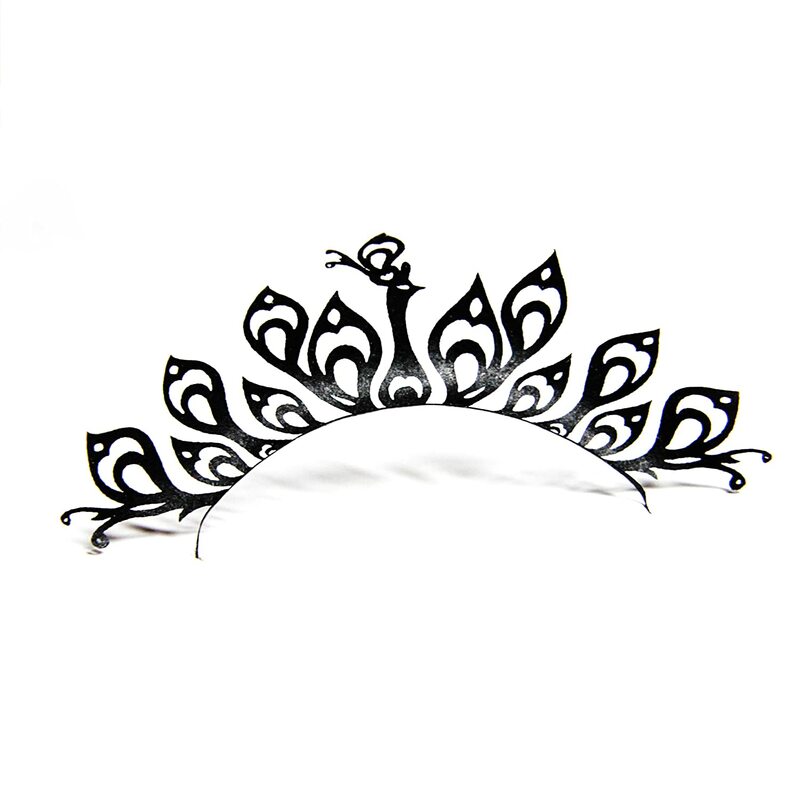 The main lash with the peacock design was not used (planning to use it another time when I want a more dramatic look). They are kind of pricey, I bought these a while ago when on sale for $9 on sephora. They are really pretty though! Here's the finished look! One more thing, I glue leftover ivy leaves together to make hair clips to attach in random areas of your wig. I made 1 big patch on my top right side (can't see in photo) and a tiny on my left side. I glued an alligator clip on the back for one. The small one I just left a gap unglued and slipped in a bobby pin. Both methods work well. How did you glue the leaves to the bottoms? Won't the swimsuit bottoms stretch when you put them on? That was actually a bit of a tough part. Since i wanted to use old swim bottoms that have stretch, I ended up wearing it as I applied the leaves >.>. Can have someone help you. But as long as you can put it on something that stretches it out while you apply the leaves it should work out. Or if you preferred, can use regular bottoms like short shorts. Where did you buy your leaves from? I bought them on EBay. click on the link above where I mention one of the leaves I used. How did you do the back? Did you glue them around the corset? Did you have any issues with the leaves falling off? Like did it hold up to lots of movement? Sorry I didn't see this comment earlier! I did go dancing with it, it held up pretty well, but a few did fall and peel off my corset/shorts because of moving and bending, but nothing noticeable, and a quick fix of hot glue if you plan to wear it again. 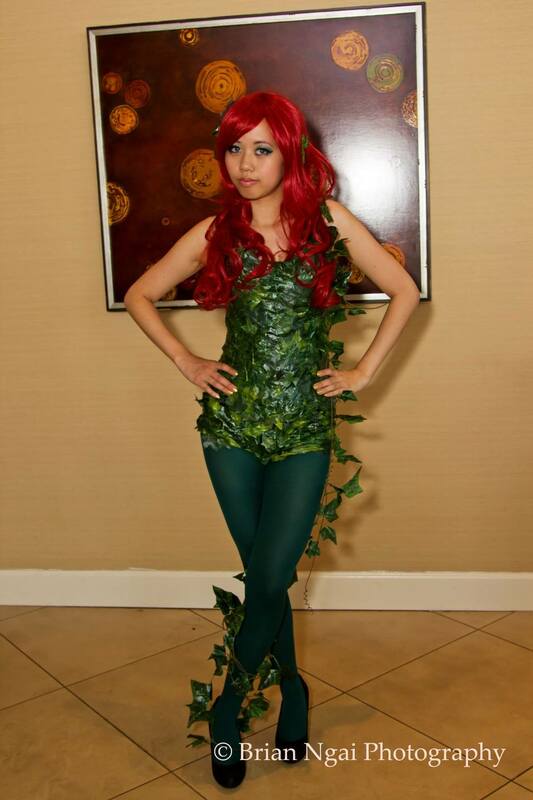 Hey Irene, you look pretty in your poison ivy costume. Do you happen to have a boyfriend?